It was interesting to watch the course of Russia’s selection at the last World Cup where the pressure to enter for the opening day of the group stage was enormous, not only because they played at home and were charged with more responsibility, but also for the poor results they had been getting in the battery of private games held over the previous months. 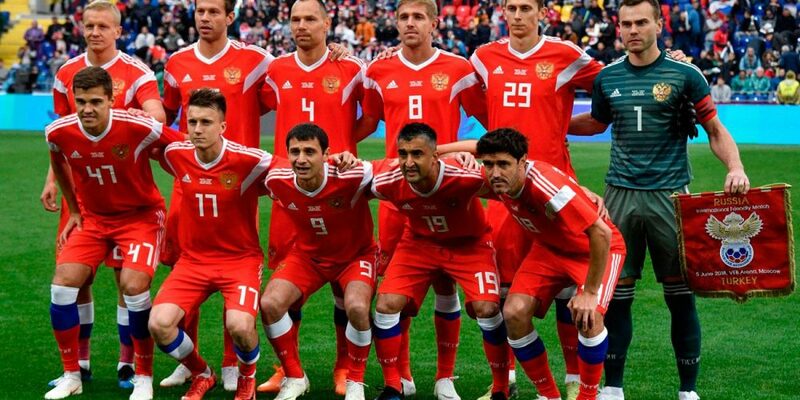 The truth is that the strong entry in the game with Saudi Arabia was a kick in that pressure, which resulted in a 5-0 rout and a confidence injection not only for the rest of the race, as – I believe – for what the pupils of Cherchesov will try to do from here on out. Away from the World Cup in the quarter-finals, the Russian team was highly acclaimed by their audience, who celebrated the arrival at this stage of the competition in great celebration and communion of joy with the entourage composed of players and technical team. After overtaking Egypt with ease (3-1) and crashing to Uruguay (0-3), Russia found strength to stop a weakened Spain (1-1) and get a penalty shootout. In the “quarters”, they fell in the same way, then against Croatia (2-2), who would be a finalist defeated by France in a new exhibition of great individual sacrifice and collective competence, as had already happened against ‘La Roja’ . The first game after that campaign was soon to count for the League of Nations, where the Russians integrate Group 2 of Liga B, next to Turkey and Sweden. Their opening match was held in Trabzon with Russia clinching a 2-1 triumph against a Turkish side who showed great defensive weaknesses and failed to translate into practice the superiority they had in possession over the 90 minutes . On the Russian side, this game highlights the offensive acuity with which they knew how to take advantage of the opponents’ mistakes – in fact, the 2 goals (by Cheryshev and Dzyuba) are born of defensive mistakes of Turkey – and the capacity of suffering that they demonstrated in the last 20/25 minutes of the match, where the Turks improved and sought more incisively the goal of the tie. Already the Czech Republic has been losing some force in the panorama of the international soccer over the last years, no longer has many footballers who play at the highest level of European football, Patrik Schick, a 22-year-old striker in Rome, is the exception and the great hope for the future, but alone it becomes complicated. Having failed to qualify for the last World Cup 2018, following a performance to forget in the final phase of Euro 2016, the Federation decided to keep the bet on Karel Jarolím, who maintained confidence in his work intact even after lagging behind Northern Ireland in qualifying for Russia’18. After their recent private matches, which go back to last June (a 4-0 defeat by Australia and a 1-0 win against Nigeria), the Czechs returned to the competition to make their UEFA Champions League debut and things did not go well. They lost 2-1 at home to Ukraine, after winning the match, with Schick just 4 minutes behind. He pointed out the various defensive errors – not only individual and collective – of this Czech Republic in the game against the Ukrainians, who felt comfortable to dominate the expenses of the game and to create danger throws, having reached the victory in the last seconds, but following several attempts to win the game. Do not think that the defensive mistakes arose from a more daring stance on the part of the Czechs, it is certain that they played at home and gave some space for Ukraine to enjoy but even in moments of defense with backward lines allowed the easy daring of the opponent in more advanced areas. In addition to Ukraine, the Czech Republic will play with Slovakia in this competition, where it is included in Group 1 of League B. Different sorts for the two teams, who made their debut in the UEFA League of Nations at the end of last week. Russia have managed to win on Turkish soil, in what is undoubtedly an excellent return to the game after the encouraging performance in the World Cup, with the Czech Republic failing to secure the early advantage of their audience against the Ukraine. At Rostov Arena, Cherchesov and Jarolím will be able to give a few minutes to less-used players, but I believe that especially for the Russians, for being confident and playing at home, winning will be important and this can provide an interesting attack from an offensive point of view. The Czech Republic showed serious defensive failure in the last meeting, it is no longer (in the last World Cup qualification, they were only able to avoid suffering in 4 games, two against San Marino and in the first two home games of the qualifying, against Northern Ireland and Azerbaijan, matches that drew without goals) and will face a Russia with an interesting offensive dynamic and that, faced with a theoretically inferior opponent, has everything to take on the expenses of the game and create some chances of goal. Still, I do not expect a Czech formation too far back on the ground and, at times, should seek to divide the game with Russia and leave for the attack, which will help if a game with danger in both beacons, although he believes more in the competence of the home team, above all because of the much greater defensive consistency he has been presenting.